Perhaps it was the ridiculous European Cookie Law (or the EU Directive 2009/136 on Privacy and Electronic Communications as it is more properly known), or maybe it was the fear that more of us might soon prefer Spaghetti Bolognese over good old roast beef, but the British electorate seem to have given Nigel Farage and UKIP remarkably strong results in the latest Euro elections. Then again a number of commentators have commented that UKIP’s results probably have something to do with advertising too. UKIP’s strength could also be something to do with building up a local network of activists – politics at its most old fashioned. But for the sake of this article, we will look at their media campaign. This must be seen within the context of the broader media’s portrayal of Farage and UKIP. Unsurprisingly enough, the right wing press take a more pro-Farage perspective, however the UKIP leader is also a favourite at the BBC where he is the most popular guest on Question Time. This has led some, such as the Institute for Race Relations, to question whether the media, including the BBC, is legitimising UKIP’s more dodgy race-based pronouncements. The UKIP marketing campaign may take place against a high media profile, but they have also spent more on advertising for these European elections than they have for any previous vote. The party spent £1.5million on advertising. According to Gideon Spanier in the Evening Standard this was “chiefly on “old” media such as billboard posters and leaflets through letterboxes”. The advantage of these media is that they can be targeted locally and are high-impact. Other old media, such as TV and radio debates (where Farage is generally thought to have performed well), have also helped. So, what about online? According to analytics firm Socialbakers, UKIP’s Facebook fan base grew by a massive 80% during May, taking it ahead of both the Lib Dems and Labour. Farage’s own Twitter account currently stands at 141k – after an increase of 4k in the last four days. And they have “the largest and most switched on fan base” on Facebook with 87% engagement according to social analytics firm BirdSong. All this is despite some very negative social media. 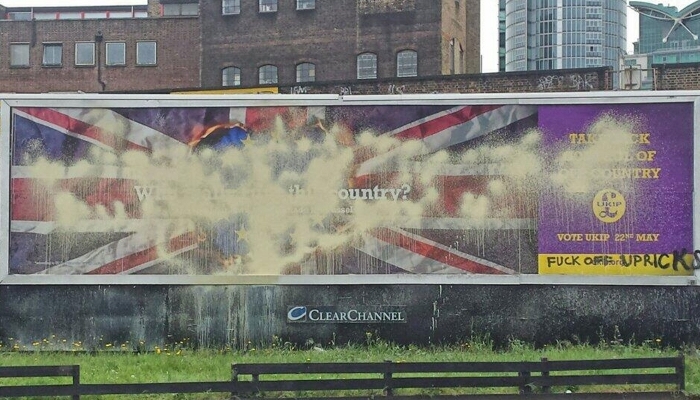 UKIP posters were ruthlessly spoofed by photoshop-savvy AntiKippers and then the hashtag #WhyImVotingUkip was highjacked and used to attack the party. It was even revealed they had hired a ‘Euro-model’ to pose in one of their posters. This is before we even mention some of the gaffes uttered by candidates that the mainstream parties would find it difficult to recover from. All this should come as a good news to virtually any company who has committed a social media faux pas. It turns out however badly you get it wrong, your core supporters won’t desert you – in fact you will find yourself with more publicity and possibly increased popularity than previously. But seriously, UKIP’s good fortune probably has something to do with their relationship with their agency. The party has engaged the services of Edinburgh-based agency Family, who have a good record of producing witty posters for the Scottish Tories. According to Angela Haggarty at The Drum, Farage has been very involved in the creative process. Meanwhile the Tories have dumped their previous agency, Euro RSCG, and have hired M&C Saatchi instead, but have done much of their work in-house (always risky). The Lib Dems are also doing most of their work in-house, while Labour have switched to new agency Lucky Generals. Despite these strong results across the country, UKIP didn’t do too well in London in the council elections and perhaps this is because the population there is “more media-savvy and educated” as one disappointed candidate put it. Whatever the cause behind UKIP’s success – it seems that we all have something to learn, whether we’re a Kipper or not.